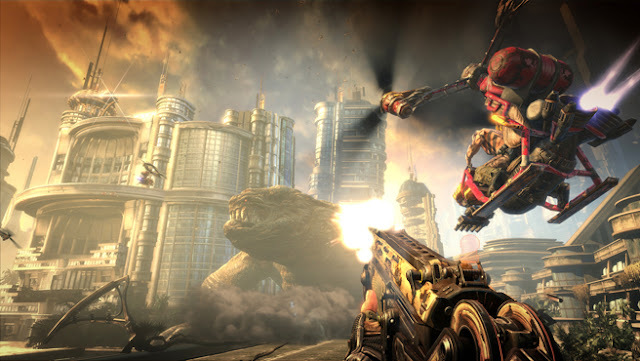 Major Nelson describes Bulletstorm as such "Play through the incredible 'Collapsed Building' level in Bulletstorms high scoring 'Echoes ' mode. Arm yourself with the PMC, Flail gun and Screamer pistol and unleash Bulletstorms unique combat mechanics and skillshot system to annihilate your foes and, more importantly, top the leaderboards! Fight your way through a towering high rise hotel that has fallen on it's side, providing you with a unique and beautiful canvas to splatter with your enemies insides! Utilise Gray's kick, leash and sliding abilities in combination with outrageously large guns that feed into Bulletstorm’s distinct ‘skillshot’ system to produce unprecedented levels of frantic gameplay and yell-inducing satisfaction." Try it - because if you like it and buy the full version, you get entry into the GOW3 Beta! You can order you copy of Bulletstorm from Amazon right now.